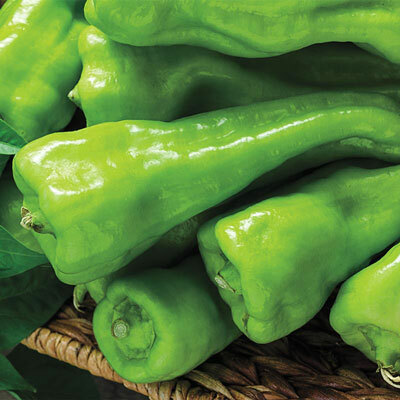 Cubanelle Sweet Pepper | Henry Field's Seed & Nursery Co.
Thin-walled, long, tapered peppers have more flavor and a lower water content than bell peppers and are the perfect pepper for roasting and frying. Best when picked while they are green but can also be left to mature until they turn orange-red.6 in. long, 2½ in. in diameter.75 DAYS. Height 17 - 18 inches. For each offer ordered, get approx 25 seeds. Height: 17 - 18 inches. Spacing: After transplanting: 18 - 24 inches between plants and 24 - 36 inches between rows. Depth: Seeds 1/4 inch deep. Plants at the same level as the pot. Spread: 11 - 12 inches. Color: Yellow-green and ripen to orange-red. Blooms: 75 day to maturity. Size: Long, tapered and thick fruit. 6 inches long x 2 1/2 inches wide.